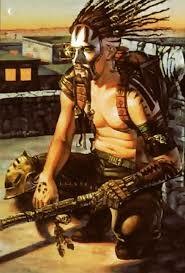 He was captured by the UCAS while on a covert mission for the Sioux Nation, and sent to do some hard time on Deimos. Feeling left out to dry as a deniable asset, Malice began re-examining his priorities and beliefs, and ended up allying with the Anarchist Black Cross/Crescent, where he has become a major force. Fiercely loyal, but very wary of trusting anyone. Has taken on a leadership role since Samson got paroled. Kicking around Seattle since his own release, organizing recruits for the rebuilding of Black Star and agitating against the corporate takeover of the Ork Underground.